Near the Mex. 15D split just south of Nogales. 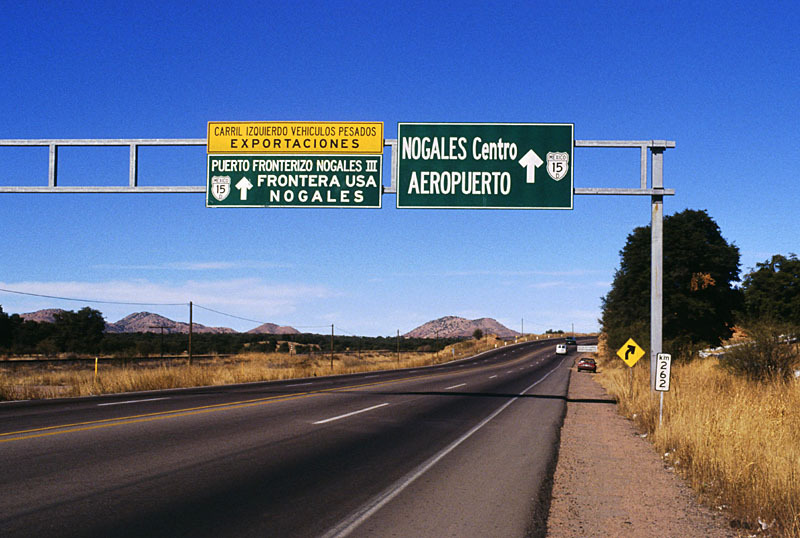 As the sign says, one branch goes to downtown Nogales (and the border crossing near where I-19 begins), while the other heads out west to what is called Nogales III on the Mexican side and Mariposa on the US side. The Mexican immigration and Customs station is actually a substantial distance south of the border and the length of the Mex. 15D expressway between the border and the border station is a closed "corredor fiscal," with high chain-link fences designed to prevent entry and exit. The fences do not stop trinket sellers, however. Photo by J. N. Winkler, 1/2003.